5 ESSENTIAL LIL FLIP TRACKS Lil Flip “Soufside Still Holdin’” The Leprechaun 2000 This was the classic anthem in Cloverland back before anyone outside his hood knew of Flip’s now-infamous Lucky Charms CD cover. Lil Flip f/ David Banner, C-Note “What Y’all Wanna Do” Undaground Legend 2002 Over a crunk uptempo beat, Flip and co. taunt the East Coast and let ‘em know how we do it down South. 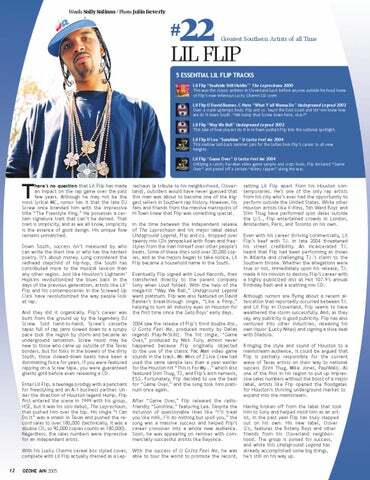 “We bump that Screw down here, okay?” Lil Flip “Way We Ball” Undaground Legend 2002 This tale of how players do it in H-Town pushed Flip into the national spotlight. Lil Flip f/ Lea “Sunshine” U Gotta Feel Me 2004 This mellow laid-back summer jam for the ladies took Flip’s career to all-new heights. 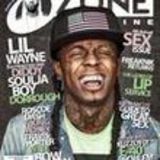 Lil Flip “Game Over” U Gotta Feel Me 2004 Utilizing a catchy Pac-Man video game sample and crazy hook, Flip declared “Game Over” and pissed off a certain “skinny rapper” along the way. setting Lil Flip apart from his Houston contemporaries. He’s one of the only rap artists from his city who’s ever had the opportunity to perform outside the United States. While other Houston artists like K-Rino, 5th Ward Boyz and Slim Thug have performed spot dates outside the U.S., Flip entertained crowds in London, Amsterdam, Paris, and Toronto on his own. Even with his career thriving commercially, Lil Flip’s beef with T.I. in late 2004 threatened his street credibility. An incarcerated T.I. heard that Flip had been performing at shows in Atlanta and challenging T.I.’s claim to the Southern throne. Whether the allegations were true or not, immediately upon his release, T.I. made it his mission to destroy Flip’s career with a highly publicized diss at Hot 107.9’s annual Birthday Bash and a scathing mix CD. Although rumors are flying about a recent altercation that reportedly occurred between T.I. and Lil Flip in Cloverland, Flip seems to have weathered the storm successfully. And, as they say, any publicity is good publicity. Flip has also ventured into other industries, releasing his own liquor (Lucky Nites) and signing a shoe deal with Diadora. Bringing the style and sound of Houston to a mainstream audience, it could be argued that Flip is partially responsible for the current wave of Texas artists on their way to national success (Slim Thug, Mike Jones, PaulWall). As one of the first in his region to put up impressive sales numbers without the boost of a major label, artists like Flip opened the floodgates for Houston’s thriving underground market to expand into the mainstream. Having broken off from the label that took him to Sony and helped mold him as an artist, in the past year Flip has truly stepped out on his own. His new label, Clover G’s, features the Botany Boys and other friends from his Cloverland neighborhood. The group is poised for success, and while this Undaground Legend has already accomplished some big things, he’s still on his way up.